Introduced in 1991 as a division of Odysseus Editions Birmingham, Alabama. Covers: In 88 pt. sea gray colored buckram covered binder’s board. Gilt title lettering on spine. Size: 5.25” x 7.75 “. Plastic coated illustrated title label on front covers 2.25” x 4.25”. Endpapers: White with scattered blue threads. Text Block: Printed on 80 lb enamel paper stock, smythe sewn. Lefty Kreh's Modern Fly Casting Method for Mastering the Essential Casts, by Lefty Kreh – 144 pp. Lefty's Little Tips: 200 Innovative Ideas For Improving Your Fly Fishing, by Lefty Kreh - 160 pp. Fly Fishing for Trout Volume 1 Special Techniques, by Lefty Kreh - 176 pp. Fly Fishing for Trout, Volume 2, Understanding Trout Behavior, by Goddard & Clarke – 158 pp. Fly Fishing for Trout, Volume 3, Small Fly Techniques, by Larry Tullis – 160 pp. Fly Fishing for Trout, Volume 4, Imitating and Fishing Natural Fish Foods, by Dave Whitlock – 132 pp. Fly Fishing for Trout, Volume 5, Fishing the Four Seasons, by Dave Hughes – 144 pp. Fly Fishing for Trout, Volume 6, Nymphing Strategies, by Larry Tullis – 152 pp. Fly Fishing Knots and Connections, by Lefty Kreh – 128pp. Fly Fishing for Bonefish Permit & Tarpon, by Lefty Kreh – 160 pp. Fly Fishing for Bass, Smallmouth, Largemouth, Exotics, by Lefty Kreh – 144 pp. 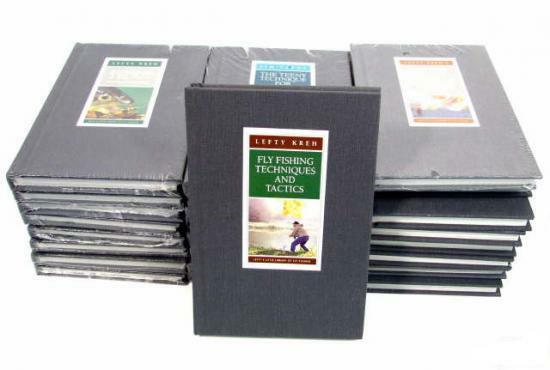 Fly Fishing Techniques and Tactics, by Lefty Kreh – 160 pp. Lefty's Favorite Fly Fishing Waters Volume 1 United States, by Lefty Kreh & Harry Middleton – 176 pp. Fly Fishing the Inshore Waters, by Lefty Kreh – 128 pp. Advanced Fly Casting: For Greater Distance and More Effective Fishing, by Lefty Kreh – 160 pp. The Teeny Technique for Steelhead & Salmon, by Jim Teeny – 160 pp. Modern Fly Lines, by Bruce W Richards – 126 pp. The Professional's Favorite Flys Volume 1, Dry Flys, Emergers, Nymphs & Terrestials, by Lefty Kreh – 160 pp. The Professional's Favorite Flys Volume 2, Streamers, Poppers, Crustaceans and Saltwater Patterns, by Lefty Kreh – 176 pp. A Field Guide to Fly Fishing, by Dennis Bitton – 160 pp. A Concise History of Fly Fishing, by Glenn Law – 176 pp. American Masters Fly Fishing Symposium part 1 - Skills by Dan Blanton, Gary Borger, Lefty Kreh, Flip Pallot, John Randolph, Jim Teeny, Dave Whitlock -160 pp. American Masters Fly Fishing Symposium part 2 - Tackle by Dan Blanton, Gary Borger, Lefty Kreh, Flip Pallot, John Randolph, Jim Teeny, Dave Whitlock -176 pp. American Masters Fly Fishing Symposium part 3 - The Travel, the Fish, the Life, by Dan Blanton, Gary Borger, Lefty Kreh, Flip Pallot, John Randolph, Jim Teeny, Dave Whitlock -144 pp. Lefty's Favorite Fishing Stories & Complete Index –144 pp. Some of the planned volumes were renamed and differ slightly from the original prospectus.